Published in the South Kent Gazette, 11 July, 1979. The more recent history of Market Street has many interesting points. Between the street and the north wall of the church, until the line of the street was altered in 1954, there was for a hundred years or more a strip of land of varying width, at the bottom of which, until about 1892, stood the barber’s shop of Mr. T. Ruffln Morris together with his house, with a garden in front. These disappeared with the re-building at that time of Waterloo House (later the National Provincial Bank and subsequently rebuilt and now the premises of the National Westminster Bank). A FINE print of St. Mary’s Church, for many years Dover’s parish church, which appeared in the book The Southern Coast of England, published fin 1849. The print is said to be older, however, dating from 1803. The fact that no clock appears in the engraving above suggests that drawing was made before 1736. 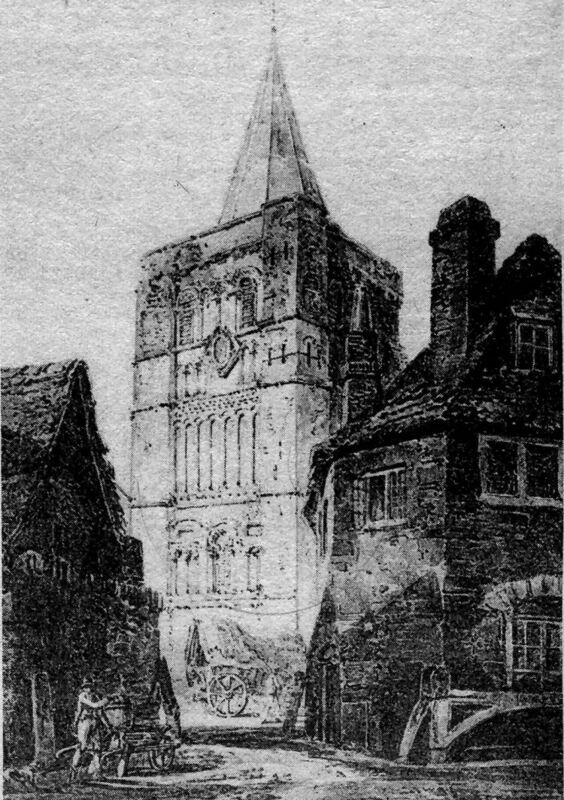 This rural-like scene showing the tower of St. Mary’s Church and buildings opposite is from a heliotype print of a drawing by the famous seascape artist J. M. W. Turner, R.A. Said to date from 1801 it shows the clock given by the Mayor, Mr. Peter Monins. This clock was erected in 1736. Under the garden, close to the street, was found a chalk coffin containing a human skeleton, and a pewter altar vessel, indicating that the deceased had been a priest. Another coffin was found there in 1956 during the digging of foundations for a new bank building. At the same time workmen found part of the jawbone, with teeth, of a mammoth said to be 500,000 years old. Also found were traces of ancient hut sites and “pot boiler“ flints. On the land higher up, where the width was greater, there were workshops for many generations. 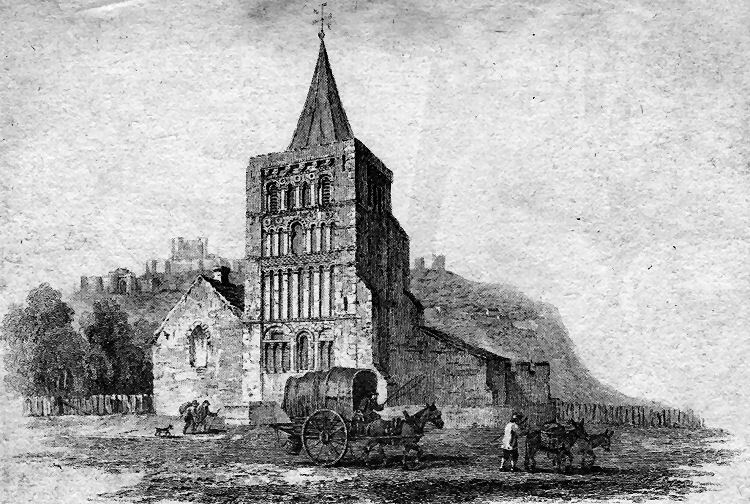 Going back as far as 1827, Mr. Edward Hills, coach builder, had his works there, and when in 1836 he moved to Castle Street, Mr. Richard Fagg, wheelwright, commenced his business there, and his sawpit had for its southern side the foundations of the nave of the Church. Mr. Edward Scarlett was Mr. Pagg’s foreman for fourteen years, after which he took over and carried on the van and coach-building business, which continued as such for many years. The motoring age resulted in the cessation of van-making, and, in 1922, Mr. R. J. Barwick bought the premises and transformed them into a builder’s yard and workshops, also acquiring, in 1923, the adjoining premises, which were built by Messrs. Dickeson and Co. as stables. At the corner of Market Street and Princes Street, Mr. J. Beach, the cork manufacturer, early in the 19th Century, established his business which was subsequently transferred to larger Dour-side premises at Charlton. A cooper’s business being conducted there about the same period by a Mr. H. Puller is an indication of allied industries at this spot. For centuries there was a candle factory on the north side. It is believed that there was a candle factory there at the beginning of the reign of Queen Elizabeth under some sort of Municipal management, in connection with which the then Town Clerk, Roger Wood, was imprisoned for his “naughty behaviour“ in “the enterlynyng of the recorde of the botchers’ tallow.“ It appeared that the Sixteenth Century butchers were required by law to deliver their fat to the Corporation at a fixed price, for the manufacture of candles at that time for local use, and 300 years later, although there was no compulsion, it was still the custom for the Dover butchers to send their fat to this factory, which was carried on for many years by Mr. Thomas Norwood, and after his death, in 1871, the business, taken over by Messrs. Dickeson and Shuttleworth, was carried on in the same way. When modern lighting systems reduced the demand for tallow candles, the coppers and machinery were removed. It was in this street, at No. 3, that the River and District Co-operative Society, in August, 1885, commenced its Dover branch, in a small shop and in a small way. The premises were incapable of enlargement laterally, but the growth of the business caused extension after extension rearward until they nearly reached New Street before they, in 1889, made their move to Biggin Street. The Dover Institute was originated in Market Street, at No. 7, the house of Mr. Archibald Wilson, in the year 1852. Mr. Wilson was an enthusiast in everything that appertained to the advancement and enlightenment of his fellow men, and it rejoiced his heart to find it necessary to again and again extend his premises to provide accommodation for the increasing members, and, eventually, further extension becoming impracticable, the Institute, in the 21st year of its existence, moved to Biggin Street, and there carried on its useful work until 1934, when the old Institute became the Dover Public Library. The Market Street premises were afterwards, called Lawson Hall, and for some years used for religious and philanthropic purposes. A few paces further up, in Youden’s Court, was placed the fountainhead of the Dover Philanthropic Society’s output of soup and bread, for the distribution of which it was established in the winter of 1838. The court in which this Society for more than sixty years carried on its operations, takes its name from its builder, Mr. J. E. Youden, who retired from business in 1848. One more establishment of a public character, for several years existing at the top of Market Street, was the Home of the Good Shepherd, conducted by Miss Hoare, the predecessor of the Dover Rescue Home which used to be near the now demolished St. Bartholomew's Church.